Sorry for the short post. I’m off to the polls. Now let your voice be heard, do you ever wear a boutonnière? I stopped by a florist on the way to my first restaurant date with the then Ms. E. . I don’t think we’ve left each other’s sides since. A flower in one’s buttonhole is a statement, and like wearing a hat, can take a certain measure of confidence. But it will put a spring in your step. This entry was posted in Elegantology and tagged boutonnière. Bookmark the permalink. Waiting to see what happens in Virginia! But even more in Maine and Washington! Viva democracy! ohh i do love a fabulous and simple bouttiniere on a properly chlothed boy. well said! The pic with the blues, and purples playing of the red is devine! CL, ain’t it the truth. I’ll just be glad when it’s over. These things get me all uptight. Viva democracy indeed, and viva liberty! Americans are making their voices heard today . . . what a glorious concept our founding fathers had. The flower is charming, and you are right about it putting a certain spring in one’s step. We are what we eat, we are what we read, we are what we do, and we are also (very affected by) what we wear. Flowers are upbeat! 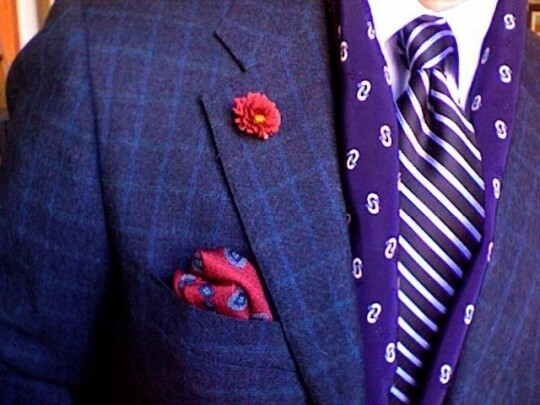 I love the combination of colors in your jacket, tie, scarf?, and the boutinniere–terrific! Hello Murphy, forgot to flip the photo in Photobooth! I considered the pin. The scarf (and gloves) came off on my return, but it was a brisk walk to the polls. Actually, as part of a family tradition, I make sure all my jackets are made with the hole for the boutonniere on the right lapel. Call it a personal touch to avoid the uniformity in style. My mother is happy to see it will be passed to the next generation. I have to agree with Paula, a great combination of colours. Adding the combination of designs may be what put Murphy off. But once in a while it doesn’t hurt to go and celebrate spring in autumn. Style with a smile indeed.